Cardinal Circuit sells used MPM Screen Printers from Speedline, one of the world’s premier manufacturers. Cardinal Circuit sells refurbished manual and semi-automatic screen printers from Speedline, Dek, Ekra, MPM, Furukawa, Zeva-Tech, Surface Mount Techniques and other manufacturers. Cardinal Circuit is the nation’s leading reseller of used and refurbished MPM Screen Printers. Our skilled service technicians ensure every Speedline MPM screen printer we sell leaves our facilities in like new condition. Discover some of the many options we have available to you and your company below. The MPM Accela Screen Printer provides accuracy and efficient performance within a small overall footprint. This printing system is highly popular for its increased throughput and advanced high-speed inspection. The Accela uses texture-based 2D inspection technologies such as SpeedVision, BridgeVision, and StencilVision to incorporate full images into its inspection process. This high performance stencil print system offers standard features such as Windows operating system, SPC data collection, closed-loop squeegee head, adjustable stencil shelf, vacuum wiper with solvent capability, three stage conveyor rail system and more. For an even more customized screen printing system, the Accela can come with a variety of specialized options including rheometric pump, automatic paste dispenser, temperature control unit, product traceability, plus others. The MPM Ultraprint 2000 Series machines are automatic printers that offer software controlled processing to reduce operator intervention. The user friendly interface is complete with real time camera images and analysis of production statuses. Built in sensors examine post-print performance allowing parameters to automatically adjust with Adaptive Intelligence. UP2000 Screen Printers also provide various options, depending on the specific machine, to adhere to many SMT manufacturing settings and increase overall production rates. These include the Quick Change Tooling option which eliminates changeover time by allowing the operator to assemble for the incoming batch of PCBs while the current is still printing. Extended Conveyor Tracks provide smooth transition from the UP2000 to most pre- and post-print SMT machines. An Environmental Control Unit option regulates air temperature and humidity within the print area for consistent results throughout various batches. 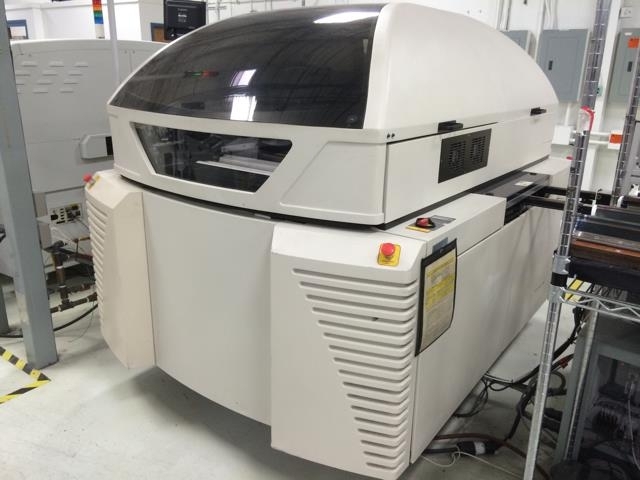 The Ultraprint 2000 also comes in a high efficiency model to excel any SMT production environment. The HiE version offers plenty of standard features and additional options for easy adaptability and streamlined results. Its modular configuration gives the printing system superior flexibility that handles a full range of board variations within a short cycle time. Precision print accuracy is guaranteed with the Balanced Control Print head for close-loop control, a tactile sensor to set squeegee height and snap-off distance, easily operated software with programmable features, and upgradeable hardware and enhancements. Standard features include automatic board-to-stencil alignment, Windows operating system, and self-leveling print head. 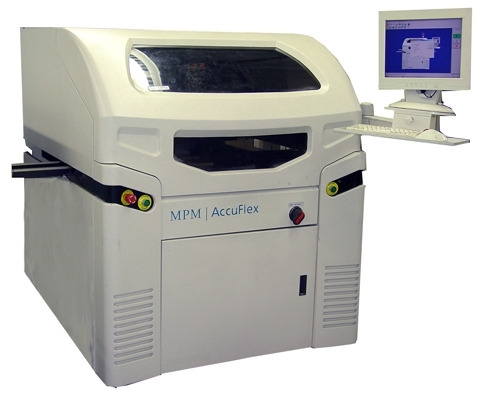 The MPM AccuFlex Screen Printer delivers quality results in a compact build for a smaller footprint. It is a perfect introductory printing machine to develop increasing production capabilities while also offering upgradable options. The AccuFlex offers automatic changeover for increased operational active time within the production line, six sigma accuracy for consistent printing results, large board capacity, and a short eleven second cycle time. Steel construction with a tubular frame provides concentrated mechanical integrity for structural longevity. There are many standard features, solidifying MPM’s AccuFlex as a great initial investment that holds its worth throughout its operational years. 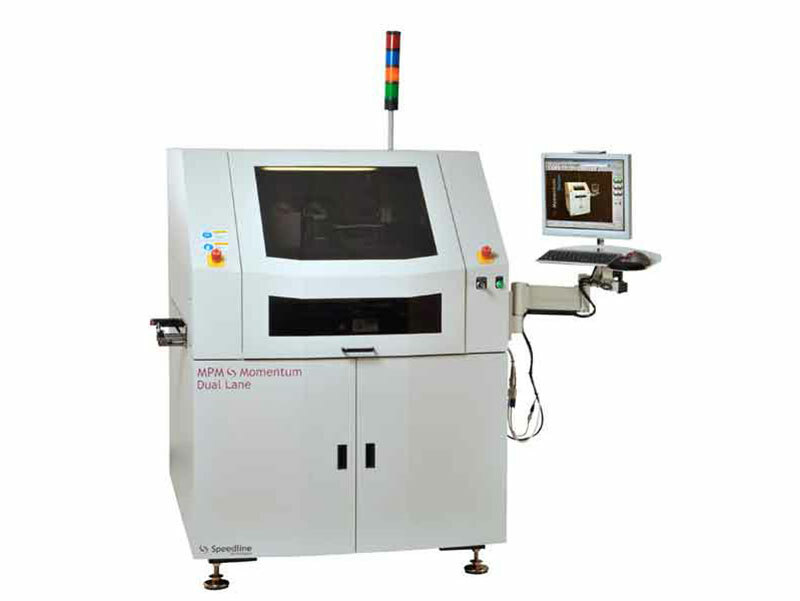 The automatic board-to-stencil alignment is unique to MPM machines and provides quick, precise product orientation. Each AccuFlex also comes with Windows operating system, multiple image capability, programmable PCB hard stops, and configurable light tower. 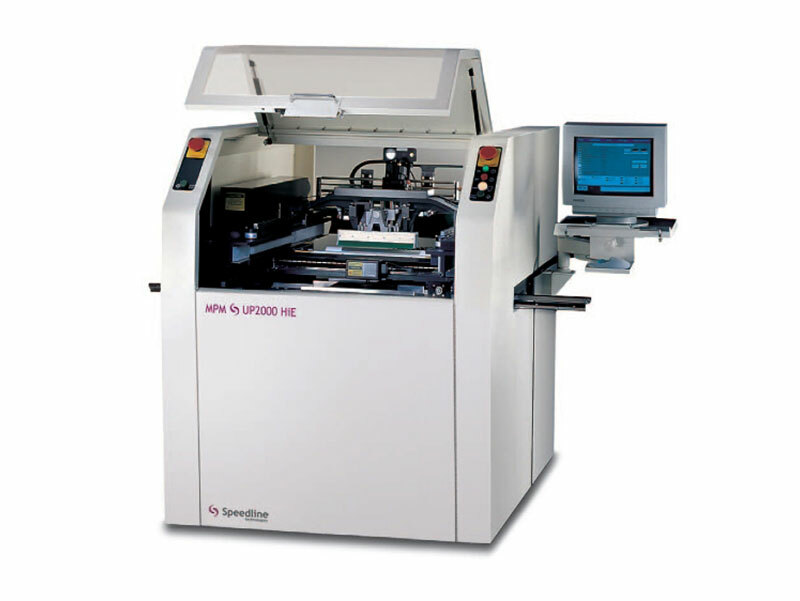 Some optional packages include the automatic support pin placement system for superior print definition, the UltraWiper Under-Stencil Cleaning system with vacuum, the Rheometric Pump printing system featuring Variable Volume Actuator paste control, and integrated post print analysis for performance measurements. 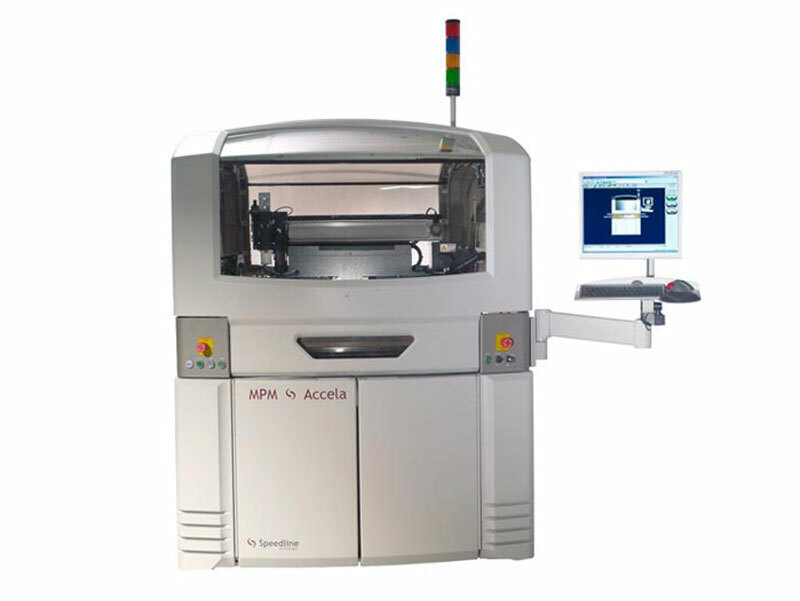 MPM’s AP Series Automated Stencil Printers offer a large, solid base and sturdy overall construction for dependable productivity. These automatic printers are managed by intelligent software to reduce operator interference and ensure fast, error-free processing. The AP 25 & AP 27 printing systems use an array of standard features to generate optimal results within a short cycle time, making it ideal for high capacity production settings. Closed loop control over printing boundaries, programmable squeegee heads, SPC software to collect data and process results, auto-alignment technology, automatic stencil wiper and solvent dispensing bar come standard on this complete screen printing package. There is also an optional paste dispense system that is fully programmable. The high efficiency AP 25, also shortened to simply AP HiE, is an automatic screen printer ideal for inline SMT production or as a standalone system. It offers unprecedented high speed and high productivity to easily handle large volume. To ensure speed and accuracy, the AP HiE comes standard with Balanced Control Print Head, a tactile sensor for proper board-to-stencil gasketing, high speed air bearings, and a cycle time just under eight seconds. The HiE package offers superior process control with optional features such as 2D and 3D verification, low contrast features, temperature control unit for consistent results, SPC software with Adaptive Intelligence, and optimized device path for low verification times. Upgradeable features like retrofitable hardware and software enhancements make this machine a great long-term investment. 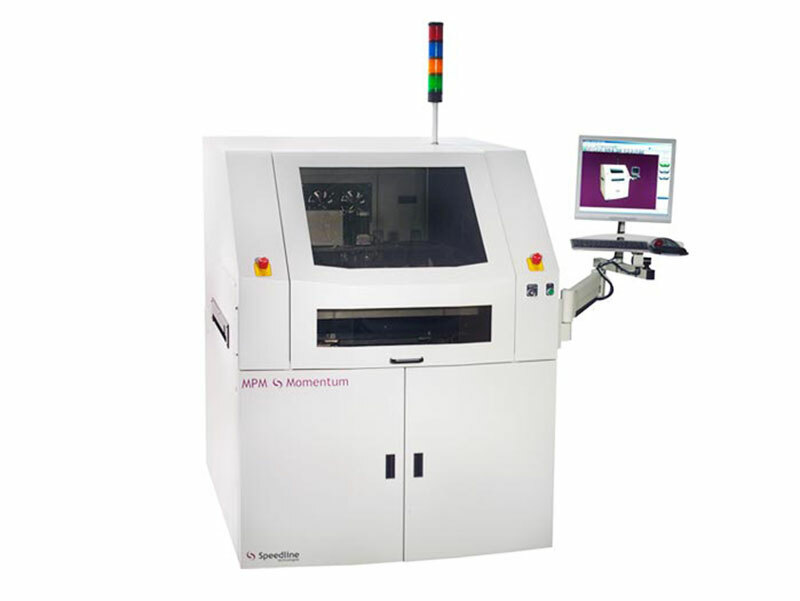 The MPM UP3000 Series Screen Printers are a line of fully automatic stencil printers that administers print medium on circuit boards enabling the application of surface mount components. This series offers both a high efficiency package as well as the Ultraflex model. 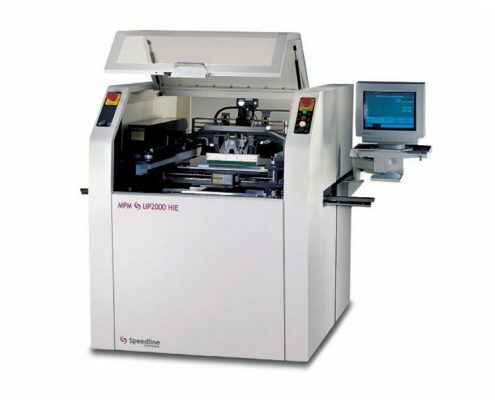 The UP3000 HiE Screen Printer operates with a trackball controller which maintains computerized motion control and easily accessible functions such as Teach Board to set up basic board files, storage for up to 400 board profiles, and automatic changeover between jobs. Standard features on these machines include control windows with continuous system status displays, quick troubleshooting through easy access components, automatic stencil retractor, and a fully programmable squeegee head. Many UP3000 HiE models also have optional upgrades, such as an automatic vacuum stencil wiper, automatic paste dispensing system, GEM communication software, auto pin placement, stencil exchanger, and 2D and 3D inspection software. The UP3000 Ultraflex Screen Printer offers superior SMT stencil printing capabilities in a streamlined process. It features a programmable squeegee assembly and paste dispensing system, an automatic pin placement and feeder assembly with a short changeover time, efficient vacuum stencil cleaner, and automatic stencil exchanger. Some of the many options available with this screen printing system include the environmental control unit for humidity and temperature control, as well as 2D and 3D verification sensing. The MPM Momentum Series Screen Printer is an economical, high performance printing system that offers innovative technological solutions coupled with exceptional capability. With a reasonable footprint and additions and retrofitting configurations, the Momentum adapts to a variety of manufacturing environments and grows with its user. 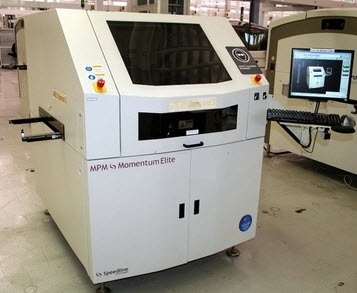 MPM’s Momentum Hi Efficiency Screen Printer is a fully automatic printing system with single rail input and servo motors as opposed to stepper motors, increasing vision gantry speeds for more efficient processing and a cycle time just over seven seconds. Wet Print technology increases this model’s overall accuracy and performance, reliability that is proven throughout the Momentum HiE’s long production lifetime. Added features include expanded 2D inspection capabilities with both contrast and texture-based examination through SPC programming tools. Auto pin placement is a simple and programmable method to ensure consistency among various boards for the highest quality performance. The MPM Momentum Elite Printing System offers the most superior performance standards of all the Momentum series printers. It is specially designed for high-volume, high-variation applications. It boasts the highest throughput and shortest cycle time, just six seconds. A triple track conveyor and servo drive motors allow more boards to be processed and indexed, increasing overall efficiency. Momentum Elite Screen Printers host a vast selection of standard and optional features. The Vision and Advanced Inspection system verifies printing results, auto pin placement precisely moves tooling pins, and PrinTrack enables precise tracking throughout the entire manufacturing cycle. RapidView Inspection option offers larger inspection images at three times the speed of the standard inspection camera. Other options may also be available depending on specific machines. 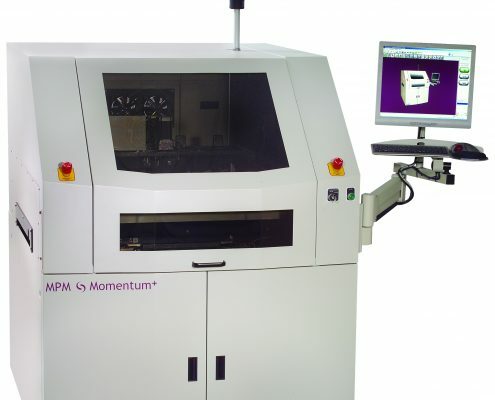 The MPM Momentum Plus Stencil Printer is a slightly upgraded model against the standard Momentum base for those wanting to increase productivity with shorter cycle times without paying for upgrades to push performance over a necessary threshold. 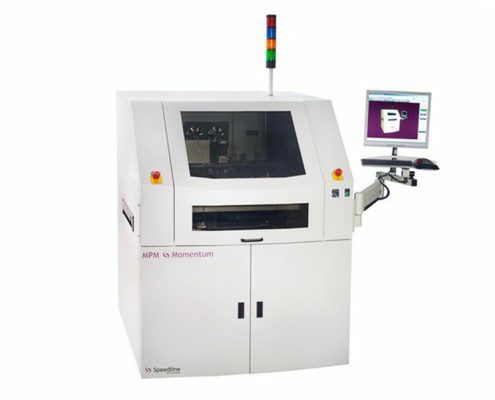 It offers the same quality board processing Momentums are known for with increased speeds, demonstrating a cycle time of nine seconds, compared to eleven seconds for the standard Momentum. Flexible and configurable software and advanced algorithm allows for enhanced throughput speeds. Optional Benchmark user interface is easy to learn and user friendly for swift setup and assisted operational tasks. Check out all the available used and refurbished MPM Screen Printers from Speedline as well as ones from leading manufacturers like DEK, Ekra, and more!